It is the year 2020, and humanity has been ravaged by monsters who attack anyone that makes a sound. After suffering a devastating tragedy, a family aim to survive through isolation on a farm, but are threatened by the forthcoming arrival of a new baby. Considering how modern horror often relies on loud noises, in order to induce cheap jump scares, a concept relying on silence is certainly enticing. 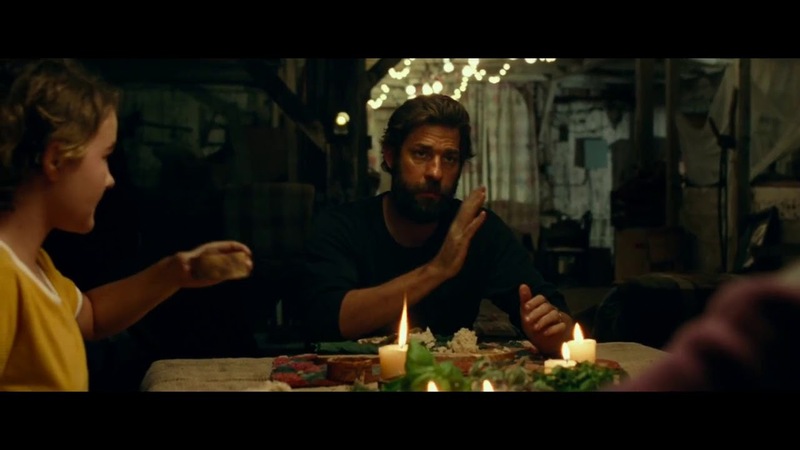 That makes it even more of a relief how John Krasinski pulls off the concept so well, utilising it to a fantastic degree to deliver an entirely effective piece of near-silent horror. After Jordan Peele, perhaps we should be looking to comedic actors for the next great horror films. Efforts are made to sell how one would live within such an unthinkable scenario, such as a path of sand being made for one to travel, barefoot, while people communicate through the use of sign language. It all works to draw viewers under its spell, as the quiet moments proving deafening, while items such as a stray nail, and an impending birth, helping to ratchet up the tension. It's through these that the use of sound proves so startling, and the delivered feel as though they've been earned. Considering how key dialogue can be upon some performances, it speaks well to the cast how they rise to the challenge. It's refreshing to see familial relationships formed and developed so well, without the need to deliver expository dialogue for the viewers benefit. We completely understand Lee's need to protect the family, wonderfully brought to life by Krasinski (acting as well as writing and directing). We feel the strain Regan feels in her relationship with her father, and Millicent Simmonds does well to bring that aspect to the screen. The fear Marcus holds, as he accumulates to this dangerous world, is captured so well by Noah Jupe. Emily Blunt tremendously encapsulates how Evelyn wants her children to be ready for what lies outside their farm, while also being frightened about what the future holds. It's a picture which relies on each cast member being on form, and thankfully, everyone most certainly is. A Quiet Place makes the most of its exhilarating premise, getting under ones skin to the point they dare not make a sound. It's a wonderfully realised idea which translates well with viewers, and bodes well for John Krasinski's future as a director.